We are delighted to announce that the World Fantasy Lifetime Achievement Award winners for 2009 are Jane Yolen and Ellen Asher. Their awards will be officially presented at the Awards Banquet on the Sunday of the convention. Our congratulations to our Guest of Honor, Ann VanderMeer who, together with Stephen H. Segal, won a Hugo Award in the Best Semiprozine category at the weekend for their magazine, Weird Tales. 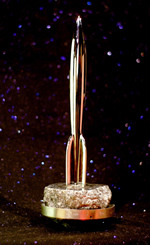 The Hugo Award ceremony took place on Sunday night at Worldcon in Montreal. Ann’s husband, Jeff, also one of our Guests of Honor, blogged about the award here. Weird Tales is also nominated for a World Fantasy Award in the Special Award: Professional category. Ann and Jeff are jointly nominated in the Anthology category for their book, Steampunk. The list of nominees for the 2009 World Fantasy Awards has been announced. You can find them here. You are currently browsing the World Fantasy Convention 2009 weblog archives for August, 2009.